Regenerative Medicine Today welcomes Dr. Cecelia Yates. 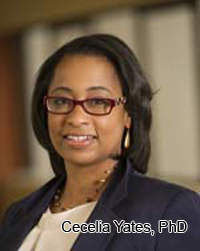 Dr. Yates is an Assistant Professor, Department of Health Promotion & Development, School of Nursing, University of Pittsburgh, with a secondary appointment in the Department of Pathology, School of Medicine, and McGowan Institute of Regenerative Medicine. Dr. Yates discusses her research in the chronic and fibrotic responses to injury and in Scleroderma. Please note that Dr. Yates cannot consult with out-of-state patients unless they come to Pittsburgh. To speak with a coordinator, please call 412-648-8976. For more information about Dr. Yates, click here and here.